The Word Cup is well under way and I have to say, there have been a lot of surprises so far! We watched the US Men’s National Team defeat Ghana while we were in Washington DC along with a small group of friends. Coincidently we at blast-off pops or firecrackers (red white and blue popsicles that look a whole lot like the jersey this year) right before each goal. 2 popsicles, 2 goals. I guess a trip to the store is in order before the next game! Anyway, since the World Cup is in Brazil this year, I thought it would be fun to share a few of our favorite Brazilian recipes here on the blog. 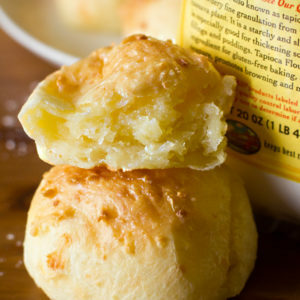 Today’s recipe is pão de queijo, or cheese bread. 4 years ago we had the opprotunity to go to Brazil spend the summer in the state of São Paulo. Stephen did an internship for his major and I got to tag along. It was such an amazing trip and we’ll never forget all of the wonderful people we met and all of the incredible experiences we had. Brazil is such a beautiful country! On our first day there our “hosts” took us to a supermarket to buy a few things and inside was a little cafe. There we sipped on fresh coconut water straight from the coconut and ate a warm little ball of cheese bread known as pão de queijo. It was love at first bite. Tender yet crusty exteriors, dense and gooey interiors loaded with cheese. These are what dreams are made of friends. Ever since that trip I’ve been dying to recreate them and today I’m finally sharing them with you. 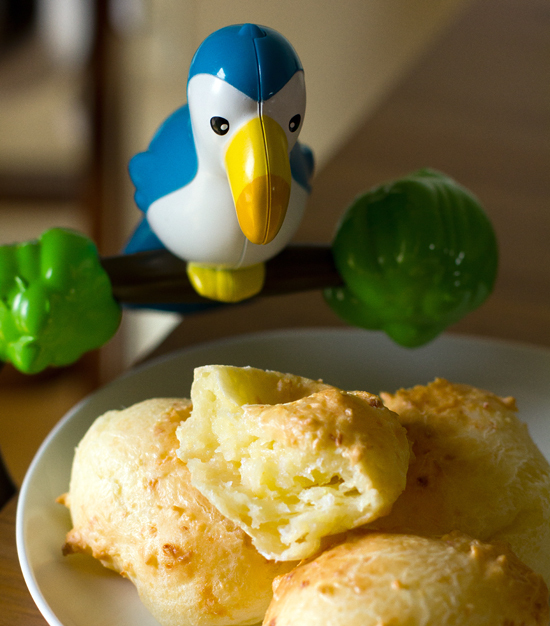 The recipe for pão de queijo is very similar to making cream puffs (or gougères) only instead of using all-purpose flour you use tapioca flour. This is a key ingredient and cannot be substituted!!! You’ll be able to find tapioca flour (or starch) at most well-stocked grocery stores with a natural foods section, a specialty store like Whole Foods or an Asian market. I was easily able to find the Bob’s Red Mill brand (pictured below) so I used that. Tapioca flour is essential for the texture and flavor of these cheese puffs. It’s naturally gluten-free and creates a gum-like texture when combined with liquids. I’m not going to go into the details of this recipe today, but I will note that you may think you’ve done something wrong when you combine the wet ingredients with the dry ingredients. Don’t worry, it’s suppose to be VERY sticky and gummy. Just scrape it into your stand mixer and beat the heck out of it until it becomes nice and smooth. When you’ve got the dough made, use an large ice cream scoop and dip in in water each time you scoop a portion, it will prevent the dough from sticking. While in the oven the pão de queijo will rise and puff over time, you’ll start to see it double in size around the 20 minute mark. Once they’re nice and golden brown on top remove them and serve them warm. 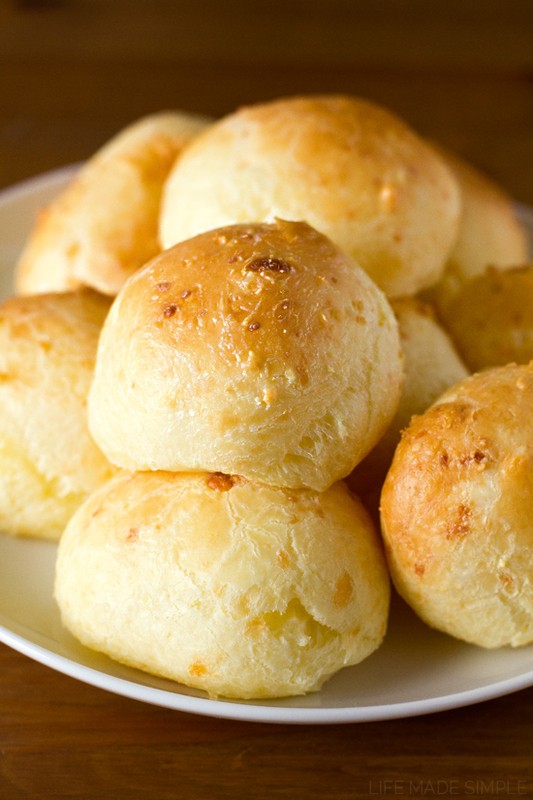 Pão de queijo is best served straight from the oven. They’re a great alternative to rolls and are especially great for those who are on a gluten-free diet. If you can resist eating them all in one day, they make excellent ham sandwiches the following day, but… you may never find out 🙂 I’ll give you fair warning now, they’re easy and addictive so be careful! Enjoy & happy baking! 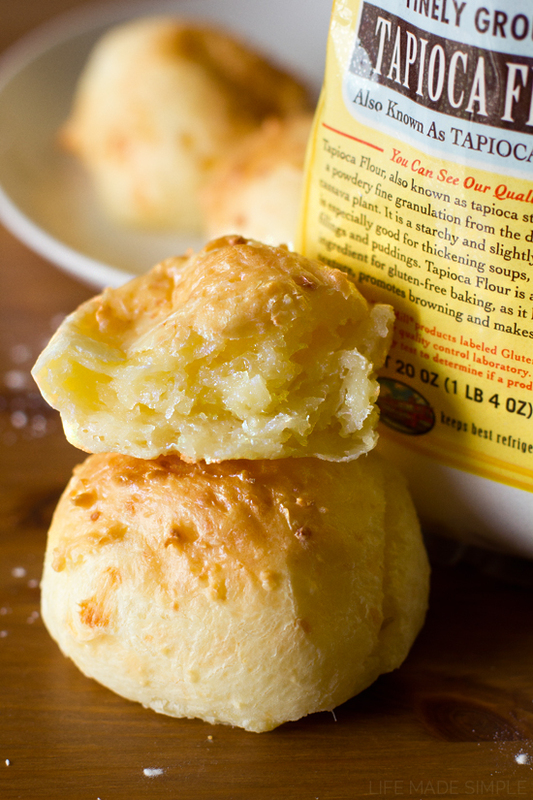 This simple and gluten-free recipe for pão de queijo (also known as Brazilian cheese bread) will be your new best friend! With crisp exteriors and gooey cheesy interiors, you just can't go wrong! Preheat the oven to 350 degrees. Line a baking pan with parchment and set aside. In a large saucepan placed over medium-high heat, boil the milk, oil, and salt, whisking occasionally. Remove when you start to see large bubbles forming. Working quickly, stir in the tapioca flour. The dough will become VERY tacky and gummy. It will almost become gelatinous. 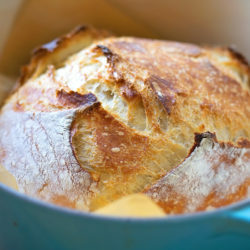 Transfer the dough to the bowl of a standing mixer fitted with a paddle attachment. Turn mixing speed on low and gradually increase to medium. Beat the mixture for 2-3 minutes until it begins to become smooth. Add the grated cheeses and incorporate. Turn the mixing speed down to low and add the eggs one at a time, beat on medium for 2-3 minutes until a sticky, stretchy dough forms. Using an ice cream scoop, create portions by dipping the scoop in water, scooping the batter and placing onto the prepared baking sheet. Place in the oven and bake for 25-30 minutes or until the tops and sides are lightly golden in color and the outsides are crisp (they may look a little greasy but that's just from the cheese, they won't be greasy when they cool). Remove from the oven and allow to cool on the sheet for a few minutes before serving. *Tapioca flour can be found in the baking aisle at most grocery stores with a natural foods section or a specialty store like Whole Foods. Bob's Red Mill was the brand I used. -To quickly bring eggs to room temperature, place in a bowl of warm water for 5 minutes, remove and use. This looks absolutely delicious! My husband would go bananas for this as it has two of his top three most favorite things to eat–bread and cheese (3rd is beef). I’ll have to add this to my must try list! I love pão de queijo, and for me it was quite difficult to say “-No!” to a bunch of them served with freshly brewed coffee in the morning. Oooh! Those sound great too, I’ll definitely give the recipe a try… I have quite a bit of tapioca flour left! Hi! Ive tried making this recipe and I’m not sure if I’m doing it right! On the outside it looks super delicious just like your pictures but on the inside they are super gooey still. The first batch I cooked for 28 min and then the second batch 35 minutes. Any tips? I haven’t had really any good bread since I found out i can’t eat gluten and I was hoping this bread would change that for me! Hi Erin! Pão De Queijo is generally crunchy on the outside and really squishy inside, it’s kind of like eating a soft cheese like mozzarella. It definitely isn’t going to be anything like a roll you are probably use to eating. 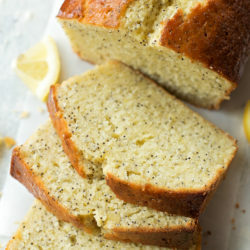 If you’re looking to make a gluten free bread recipe, I’d highly suggest using Bob’s Red Mill 1 for 1 flour and just use that in place of all-purpose flour in a regular recipe. It’s a fantastic blend!! My dough never really made it to the “dough” stage. It stayed more like a batter. Added more tapioca flour and it helped a bit, but the finished product was a bit too tough. They looked more like golden flying saucers than round little rolls. BTW my family loved them all the same! It is the case that a few recipes are extra soft. I’m from Minas Gerais (pão de queijo’s birth place) and the recipe I use is like batter. I’d say add extra cheese (so much cheese you start smiling frantically – that’s me) and you can also form the balls with yor hands, just use a bowl of water to make your hands damp first, this way the dough does no stick too much to them. I’ve made these several times now and they are so delicious. I’ve tried the Brazilian cheese bread from the frozen food section of the grocery store but didn’t care for them nearly as much as these. Thanks for a wonderful recipe. 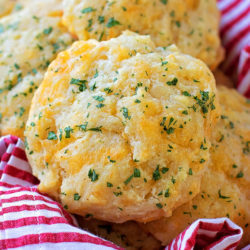 i have made cheese bread a few times now and its always turned out great. I made this recipe just the other day and had no issues with it, this time however I am finding that the batter seem quite a bit more loose than before which is baffling to me as I followed (or so I thought) the recipe. maybe the eggs were bigger or something but I’m wondering if I let this chill in the fridge if it might help firm things up a bit before I try to bake them so I can have the desired shape of a roll??? If I can remember I will update with the results. I don’t see why you couldn’t refrigerate it. Sometimes humidity can change the consistency of dough, but bigger eggs could be it too. You could always try adding a bit more tapioca flour to see if that helps. Thanks, these were really lovely. I made one in a pan and after it cooked covered it with pizza toppings and cheese and it was like a stuffed crust pizza. Such a treat. In Botucatu, SP I had this cooked in a waffle iron — it was at the Minas Gerais store. So delicious! I usually bake mine in mini muffin pans. Lots more nibbles that way.